In a Nutshell: Companies have used enterprise resource planning (ERP) software for decades to organize and execute back-office processes like HR, payroll, and accounting. Advances in technology in recent years have increased the usefulness of these programs by automating repetitive tasks and eliminating the need for human interaction with the software. Unit4 is leading the innovative charge with a cloud-based ERP that features its digital assistant, Wanda. The ERP runs on a single architecture platform, where new processes can be added seamlessly and the entire system can be scaled to meet client needs. More than 3,500 worldwide companies currently use Unit4’s ERP, with client organizations ranging in size from 500 to 50,000 employees. Not too long ago, vital office management tasks, like purchasing, payroll, and timesheet management, required hiring teams of accountants and using enough paper and ink to keep office supply stores in business for decades. Technological advances have decreased the number of physical materials needed for bookkeeping and increased access to automated programs that complete tasks faster and more efficiently. Enterprise resource planning (ERP) solutions have been around for the better part of three decades. The processes included in these programs allow organizations to use a system of integrated applications to manage their business and automate many back-office functions related to technology, services, and human resources. But as technology evolves, ERP programs become more intricate, and in some cases, more difficult to use. 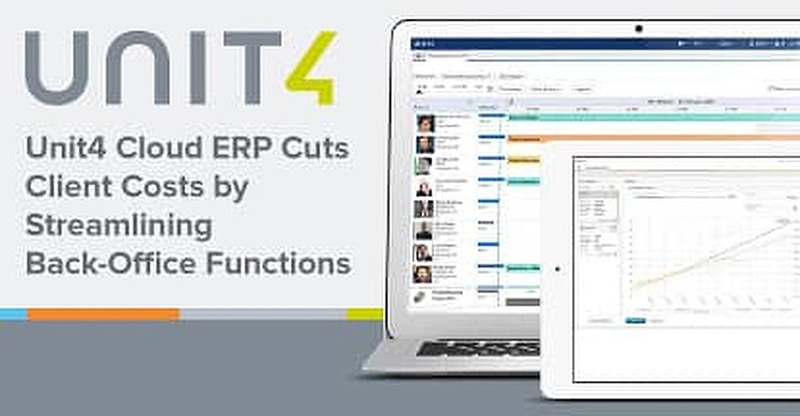 To solve the problem of complicated interfaces and multiple back-end processes that aren’t stackable, Unit4 offers its Cloud ERP solution to global businesses of all sizes. The program, which includes many scalable modules all built on one piece of architecture, is intuitive and insightful to use, easy to change, and flexible to consume. Staven said many clients start with a single piece of software — often the superior accounting modules — and expand to add other features over time. The process is seamless and requires little change since new features are simply added to the client’s existing platform. The solutions have been adopted by more than 3,500 global businesses of all sizes that seek new ways to cut costs while increasing productivity in their backend operations. Since the software is built on the same architecture and platform, it allows customers to take on new functionalities with little effort. Norwegian ERP software house Agresso Group began development of the ERP solution in the late 1990s. When Unit4 merged with Agresso in 2000, the solution was a key factor in negotiations. Thomas Staven is Vice President of ERP at Unit4. “The ERP that Agresso developed is still the foundation of the Unit4 ERP business solution that we’re providing to our clients today,” Staven said. Many of the ERP users are based in Europe, though Staven noted the company currently has a growing, profitable client base in more than 100 countries around the world. Unit4 clients are predominately midsize to large organizations, with between 500 and 5,000 employees, though enterprises with as many as 50,000 employees use the software. The core capabilities of the cloud ERP include a robust set of financial management tools, HR and payroll resources, modules that focus on procurement management, project management, reporting and analytics, and field service and asset management. Digital assistants are all the rage in today’s tech-driven world. Consumers are now accustomed to asking Siri, Alexa, Cortana, or Bixby for directions or the business hours of nearby restaurants. Unit4 is taking that familiar model and bringing it to ERP with its digital assistant, Wanda. Released in May, 2017, Wanda makes use of natural language processing and machine learning to help ERP clients automate, prioritize, and complete repetitive tasks in a fraction of the time they typically take. Wanda is embedded in the user interface and can be accessed through popular chat programs like Skype, Slack, Teams, or Facebook Messenger. Unit4 is working on making the program compatible with popular devices like Amazon Echo and Microsoft Cortana. Using natural language when chatting with Wanda makes the experience similar to talking with a colleague. Wanda can complete multiple tasks at once without the user ever logging into ERP. As an HR assistant, Wanda completes tasks like requesting paid time off and asking for vacation time balances. Wanda can also assist in finding products and suppliers, generating requisitions, and managing approvals for purchasing. A simple voice command can prompt the assistant to generate timesheets based on multiple data streams. Calendar features allow the program to remind managers to approve tasks and flag important tasks when deadlines are looming. 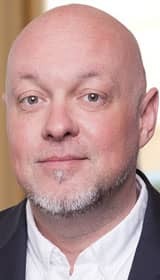 “I think this way of communication with an ERP is fantastic compared to the more complex ways people interacted with ERP in the past,” Staven said. Despite ERPs status as traditional pieces of software used by businesses to help organize and automate back-office processes, Staven looks at Wanda and other innovations being developed by Unit4, and sees a revolutionary future for the solutions. Unit4’s plans for its ERP solutions don’t stop with digital assistants like Wanda. Staven said the company foresees a future where its software can run a back office with minimal oversight necessary. More than 3,500 worldwide clients already use Unit4s ERP solutions to manage back-office processes like HR, accounting, and payroll. New and existing clients regularly add new processes onto existing platforms, thanks to program architecture that makes additions seamless. Those clients range in size from 500 to 50,000 employees, all taking advantage of the agile software that can be scaled to meet the demands of any size organization. Wanda, the company’s digital assistant, can complete tasks and respond to commands using natural language in real-world chat programs without the user logging into the ERP. The process is a far cry from the old days of ink, pen, and ledger books that get stored away in dusty filing rooms for decades. For Staven and his Unit4 team, the goal is to continue to make old processes and tasks obsolete in a new, digital ERP age.